Although Pipestock always recommend that customers follow the manufacturer's installation instructions, we have provided some basic guidelines below. Prior to installation, check you have selected the correct flexible connector for the application's pressure, temperature and media requirements. Before installing flexible connectors, they should be checked for any damage internally and externally, with particular attention paid to the mating face. Make sure the sealing face is clean and free of debris as this will prevent a reliable seal being formed with the mating flange. Flexible connectors should be installed at their natural length. If gaps are being left in the pipework for retrofitting, make sure this gap conforms to the exact natural length of the connector. Pipework should be aligned before installation; the connector is not designed to compensate for poorly aligned pipework. The correct mating flange should always be selected and the sealing face checked for debris and any sharp edges as this could result in damage to the rubber. If the faces of the mating flanges have different diameters, a sealing gasket should be used to avoid damage to the rubber face. Flange bolts must be fitted with the bolt head nearest the connector to avoid damage to the rubber. Bolts must be tightened in a gradual manner tightening opposite bolts in turn. Do not over tighten as this will result in leakage. It is advised to check the tightness of the bolts after seven days. It is essential that flexible connectors are anchored to protect adjacent pipework and plant. 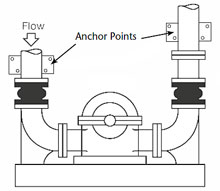 The diagram below shows how to anchor pipework in close installation to pumps. The selection of tied rubber flexible connectors should be considered above 100mm when the pressure is greater than 2.5 bar. Many years free of trouble can be achieved with properly installed flexible connectors. It is essential they are used within their temperature pressure and media limitations. Periodic inspection of the rubber is advised to check for deterioration and flange bolts checked for correct tightness. The rubber should never be painted as this could damage the rubber and lead to reduced performance and service life. These fittings are designed to protect pipework joints and can save you the cost of damage and pipe system downtime. They allow for the expansion and contraction caused by temperature variations within a pipe system and additionally they are able to isolate pipe systems from pump vibration which could cause damage. The flexible connectors are made up of a combination of different materials. EPDM and NBR are used, depending on the connector selected, and these are the materials that provide the protection to the pipework. Ethylene propylene diene monomer is a synthetic rubber used for a variety of applications. It is heat, ozone and weather resistant and has a range of chemical resistance. Most of all, EPDM acts as an absorption material for the vibrations caused by pumps and allows for the expansion and contraction of pipework without any damage. Nitrile butadiene rubber is also a synthetic rubber, resistant to oil, furl and other chemicals. It has a wide temperature range and is particularly resilient, making it a durable material. As with EPDM, the NBR material absorbs vibrations and allows for expanding and contracting pipework. Other materials include metals and plastics which are manufactured from high quality raw materials to ensure a good service life in the product.